K-Sea Plus: New Job What to Wear?? Decisions, decisions with a new job come so many decisions. 401k, health insurance, buy lunch or bag lunch; it’s enough to make my head hurt. I’m not complaining though. It’s a great job and I love being employed lol. One of my biggest decisions is what to wear every day. I've been watching what everyone else wears to get the feel for the atmosphere. Everyone seems to wear black & gray. I’m more into bright colors and animal prints. So I’m slowly adding colors. Today was Empress Teal color polo I recently got from Avenue. Love bright spring/summer color. Also, I did my nails. Came out really cute. Plus it was totally cheaper the going to get another Mani. 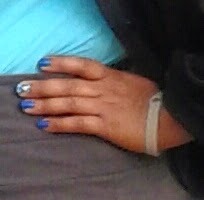 Used Sally press on design and blue nail polish to match total cost $2. Thank you Dollar Tree.